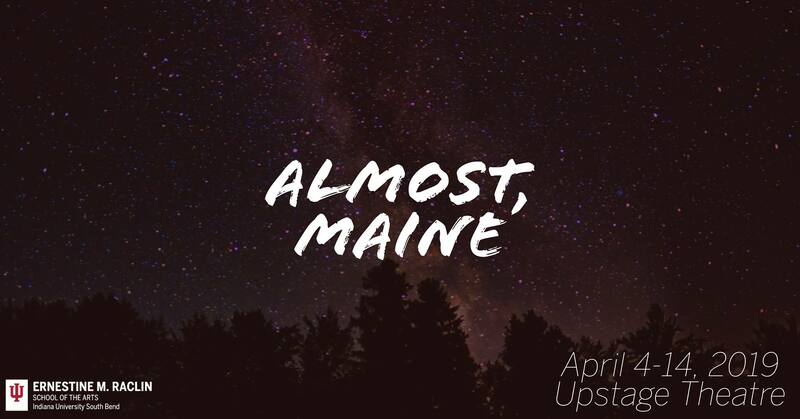 Almost, Maine hits the Upstage Theatre on the weekends of April 4 and April 11. It is a romantic comedy where the action takes place in a fictional place in Maine. This place is where stereotypical metaphors for love become true, such as falling in love and fixing a broken heart. The play has eight scenes along with a prologue, interlogue, and epilogue. These scenes are not chronological; each scene takes place in the same five minutes. This is shown through lines stated by the characters and through the appearance of the Northern Lights in each scene. Each scene also contains only two or three characters. Each of these characters deal with a different form of love, from budding romances to losing love. The cast is comprised of four male actors and four female actors, all of which are double or triple casted for the roles. Cast members include Mateo Bessera, Molly Hodge, Abbrinnia Austin, Patrick Watterson, Jinesh Sanghivi, Mya Piccione, Sam Turner, and Eddie Castle. The play is directed by Assistant Professor of Theatre, Justin Amellio. Actors had the challenges of crafting two or three different characters for the performance. Amellio implored actors to distinguish each character. This play also has another unique challenge in store for the actors. The playwright, John Cariani, used punctuation marks in inventive ways in order to get an exact rhythm for the lines in the show. Examples of these include (! ), (//), (<), (-), and (-..._). This is because the playwright wants actors to know when their characters are not listening to each other versus when they are connecting. Learning how to implement these new grammar rules was quite a challenge for actors. However, these hurdles turned into acting evolution with Amellio’s help and guidance to the actors. As the play comes to the opening performance, actors are putting on the final touches to perfect their performance for the opening weekend. Almost, Maine will be present in the Upstage Theater from April 4-6 at 7:30 p.m.; April 7 at 2 p.m.; April 11-13 at 7:30 p.m., and April 14 at 2 p.m. Tickets can be purchased in the Box Office or online for $5-15.